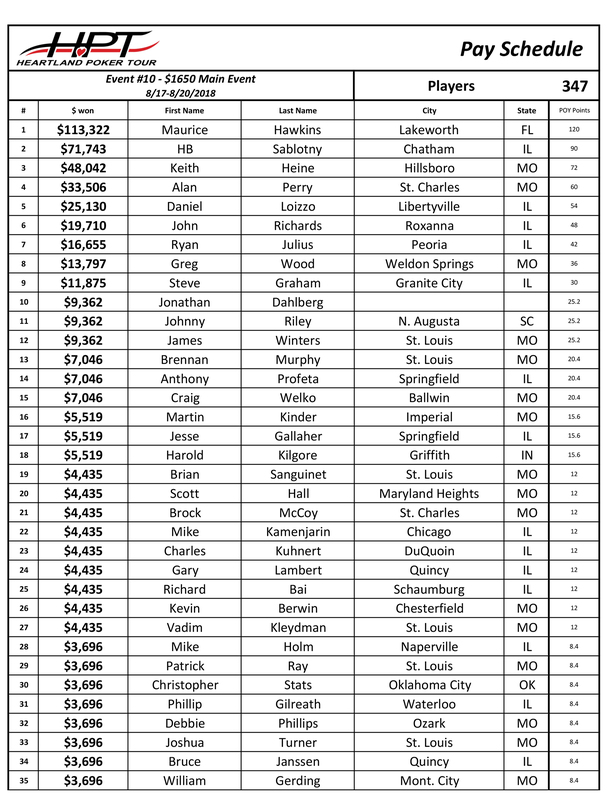 Maurice Hawkins battled through 347 entries to win HPT St. Charles for his seventh $100K+ score. Maurice Hawkins is best known as a master of the World Series of Poker Circuit, what with his 11 gold rings and former standing as the all-time leader until recently. He showed he can get it done on the Heartland Poker Tour felt too, though, taking down HPT St. Charles $1,650 Main Event for $113,322. It's the seventh six-figure score for the boisterous pro. 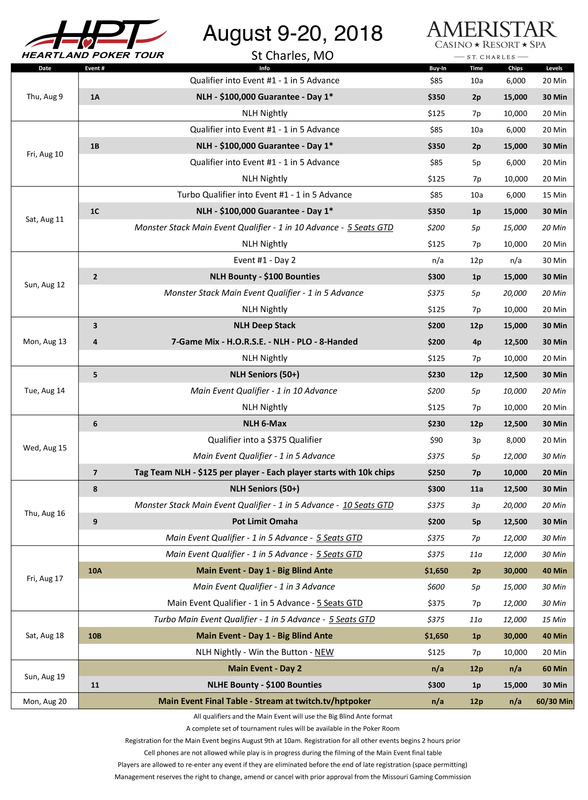 The tournament, which took place on the outskirts of St. Louis, drew 347 entries over the course of its two starting flights, with 36 of those paid out. Josh "JT" Turner, Chris Staats, Richard Bai and Mike Holm were some of those who made the money but fell short of the final table. Hawkins ran into a hairy spot on the final two tables when he got turned aces up in against a flopped set of kings for the majority of his stack. Luckily for Hawkins, according to the live updates, he hit his two-outer on the river to avoid being left with 15 big blinds. Thanks in part to that, Hawkins made the final table with over 1.6 million at 10,000/20,000/20,000, second only to Ryan Julius' 1,827,000. Steve Graham was the first player to bust out at the final table, getting in a flip with sevens against the ace-king of HB Sablotny and dodging neither an ace nor a king. Julius then busted a short-stacked Greg Wood, but the good run wouldn't last for him. He'd actually bust out next, losing most of his chips on a Qc8d6c flop when he bet-three-bet all in with nines and ran into Sablotny's Qd8s. The top two held and Julius dropped to about 10 big blinds. Julius would lose those shoving Ah2h and getting isolated by Keith Heine and his KsQc, only to see a queen hit on the flop. Three-time Circuit ring winner John Richards got himself in a good spot with kings all in against sevens held by Daniel Loizzo but a seven hit on the flop to leave Richards on only 20 big blinds. He was even shorter when he defended big blind with king-four and flopped top pair, only to run into a set of sevens flopped by Sablotny and bust in sixth. Sablotny then sent Loizzo packing when ace-queen got there against pocket nines. Former Mid-States Poker Tour champ Heine busted Alan Perry after that when ace-queen held against king-jack. He and Hawkins were basically tied three-handed, while Sablotny held half of the chips and over 100 big blinds. Hawkins dropped down under 20 big blinds but then recouped his losses in a three-way all in where queen-jack got there against ace-give and tens. He then coolered Heine as they saw a board of 8h9h6c9d, with Heine bet-three-betting all in with 9c7c and Hawkins holding 9s8s for an unbeatable full house. Only a chop could save Heine, but he hit a worthless straight on the river. Sablotny had the lead to start but the heads-up match would last over three hours, until only about 50 big blinds remained on the table. Finally, Hawkins flopped a straight and Sablotny turned aces up, missing on the river after he got stacks in to bow out in second for $71,743.